Learn one hundred everyday words with this Arabic/English vocabulary book, delightfully illustrated by Stephen Cartwright. Above the scenes there are clear illustrations of each word, with the Arabic word, pronunciation guide and English translation. 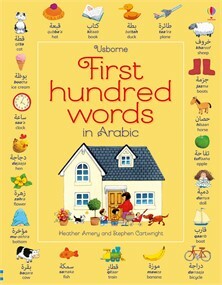 Readers can hear the words read aloud by a native Arabic speaker at the Usborne Quicklinks website.